Holiday.gr - KIMOLOS, a trip to a myth! Been to KIMOLOS ? Share your experiences! 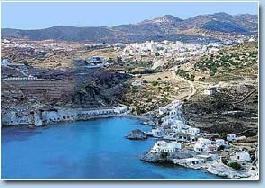 Kimolos is an unexplored paradise. This small island with incredible natural beauties belongs to the complex of southwest Cyclades islands and it is very close to Milos. It has a ground of 37sq. km and it is a volcanic island with a variety of rocks. Some of the rare rocks we meet in the island are perlitis, kaolines and the highly impressive white rock betonitis or kimolia land, as it is mostly known. In Kimolos you can find deposits of semi-precious stones, like amethyst, quartz and opal. But, apart from rocks, the island is famous for its fauna and flora. Its shores are a shelter to Mediterranean monk seal, while in the hilly bulks you will meet the rare specimen of viper lepetina, the blue lizard, the golden owl and thalassokorakas. Kimolos has beautiful beaches that satisfy all tastes. Thin sand, pebbles and rocky shores compose a unique puzzle. The beaches of Aliki and Bonatsa are the biggest in the island. The beach of Agios Georgios with the white sand is one of the most impressive landscapes in the island. Small ports with hidden beaches reached only by boat give the sensation of a private beach.